I launched my business in 1989 while working at Bond Street Books (Book Castle, Inc.) in Burbank, Calif. After four years of growing the business, I made the pivotal purchase of Helen Brown’s cook books. Although I began to catalogue and sell the collection immediately in order to make the monthly payments I’d agreed upon with her husband, Philip S. Brown, I put a number of books away; earmarking them for archival restoration at some later date. 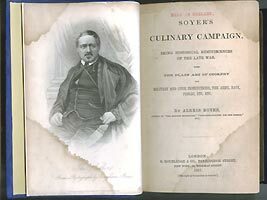 Most of the books from Helen’s library have found new homes by now, but Soyer’s Culinary Campaign stays with me. 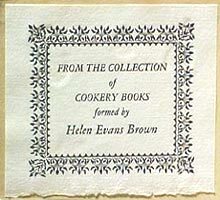 I’m starting to work on the listing for a rare book that I purchased; as part of a group of food-related books, from the cookery book collection of the late Helen Evans Brown.